I’ll admit, Robert “The Ghost” Guerrero’s PR team has done a heck of a job these last few days. They’ve actually created some buzz for their guy…despite how ridiculous the assertion is of Robert Guererro challenging the best fighter in the world, pound for pound, Floyd Mayweather. The other day a silly press release went out, 22 fight experts weighed-in on how Floyd Mayweather and Robert Guerrero match up. Last I knew, these types of things run the week before a big fight, or at least, you know…when a fight is actually going to happen. 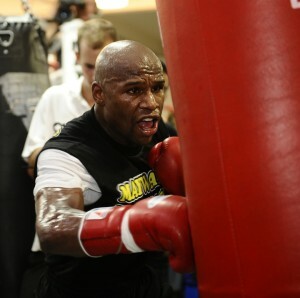 Call me skeptical, call me crazy…but I just can’t see Robert Guerrero fighting Floyd Mayweather on May 5, 2012. Keep in mind, I could be completely wrong. So wrong that I hadn’t even considered Robert Guerrero as a frontrunner in the Mayweather sweepstakes. It just doesn’t make any sense. That’s not to say that Guerrero would be a bad opponent. He’s an excellent fighter, and until his shoulder injury this past summer (an injury that forced the cancellation of a scheduled bout with Marcos Maidana), he looked to be rapidly advancing toward the elite level of prizefighting. He hasn’t quite gotten there yet though. Not that Guerrero doesn’t believe he has a chance. He stated his case to Robert Hough of Fight News earlier today. It’s a hard sell. Especially from someone coming off of surgery who hasn’t fought since last April…against Michael Katsidis…at Lightweight. If you study the guys who Floyd fights when he fights them, they’re typically guys who are coming off of a huge win—guys on the cusp of mainstream appeal. Look no further than a guy like Victor Ortiz. Although Guererro has had his share of HBO exposure, it hasn’t been near the level of investment HBO and Golden Boy had put into a guy like Victor Ortiz. Couple that with Victor Ortiz having a career defining performance against then-undefeated WBC Welterweight Champion Andre Berto in a Fight of the Year candidate on HBO Championship Boxing prior to challenging Floyd. Guererro hasn’t been on that level yet. What is there to suggest that he would be anything more than a B-side attraction against Floyd Mayweather? If thinking strictly in that frame of mind, a guy like James Kirkland would make more sense. Boxing fans have a short attention span. You can bet your bottom dollar more people would be interested in Mayweather/Kirkland rather than Mayweather/Guererro. Still, there are a few reason why Guererro would be a good opponent for Floyd. He is a southpaw, and if Floyd still looks to a future fight with Manny Pacquiao, fighting another one can’t hurt. Then there’s the whole Cinco de Mayo thing…typically a big weekend for Mexican and Mexican-American boxers to fight on. And in the end, Robert Guererro is very good fighter. With a record of 29-1-1 and a few World Championships on his resume…he’s a guy to watch out for. I just don’t know if he’s a guy Floyd Mayweather needs to watch out for next.